New edition of the four Ed Sullivan Shows starring The Beatles. 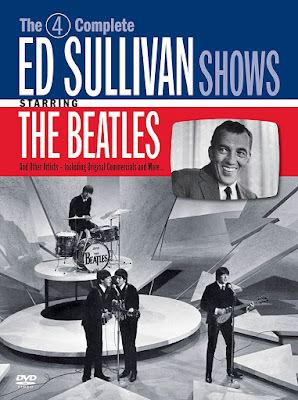 New edition of the Beatles' Ed Sullivan Shows to be released on May 25, - but still only on DVD, and not Blu-ray. Still, the image is digitally upgraded (so, no new transfer, just digital enhancement?) from standard definition to high definition video. This looks like a US release only, so far. no blu-ray option.......oh well looks like a 4k deluxe will occur in a decade. I doubt there’s a lot to gain in quality. No high definition source exists for these shows, they were recorded on standard definition NTSC videotape which renders at roughly 483 lines (525 counting the lines you can’t see). This «digital enhancement» is unlikely to do wonders. mayhaps - hopefully - these are from the CBS masters - "Hi-Band" 2" quad video tapes? the previous release is from Sullivan's masters (Sofa Entertainment) - which were recorded in the Sullivan Theatre on "lo band" quad machines. i have the previous release on DVD and i SWEAR that a bootleg copy i had in the 1980's looked much better (my copy was on a 3/4" videotape). IMHO - as a old video pro - there's very little that can be done with an old, soft NTSC video - witness the "digitally enhanced" moon walk footage - still looks like crap. sound like the name of a band that john peel would've played on his radio show "giant grey legos in a thick fog"
I'll stick with my Misterclaudel boot set. Wonder if we will get to see the 1965 rehearsals at some point. We had a bit of a teaser of Help!, but I assume the whole 2(?) rehearsals still exist.